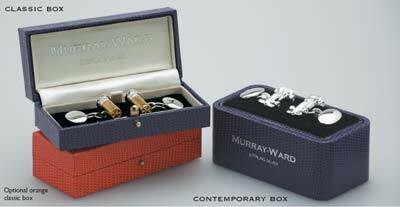 Since 1988 Murray-Ward has been designing and producing high quality sterling silver cufflinks. Exclusive stores and labels worldwide including Harrods. Liberty, Selfridges, John Lewis, Austin Reed, Simpsons of Piccadilly, and Gieves & Hawkes have been proud to sell the brand - from the sporting collection to the more classic and contemporary designs. Now, through this website our unique cufflinks are available for you to buy directly. Murray-Ward's unrivalled range is ideal for Valentine's gifts, wedding or anniversary gifts, Father's Day gifts or for any other special occasion. Our sporting jewellery is also a popular choice for competition prizes and for kitting out entire sports teams in elegance and style. They also make highly desirable corporate gifts for discerning customers looking for something out of the ordinary. For three decades Murray-Ward's founder, Helen Ward, has been the driving force behind the creation of the distinctive designs for which the brand has become known. Her love of sports and country pursuits continues to provide the inspiration for this ever-popular and diverse range of sterling silver sporting cufflinks and jewellery.